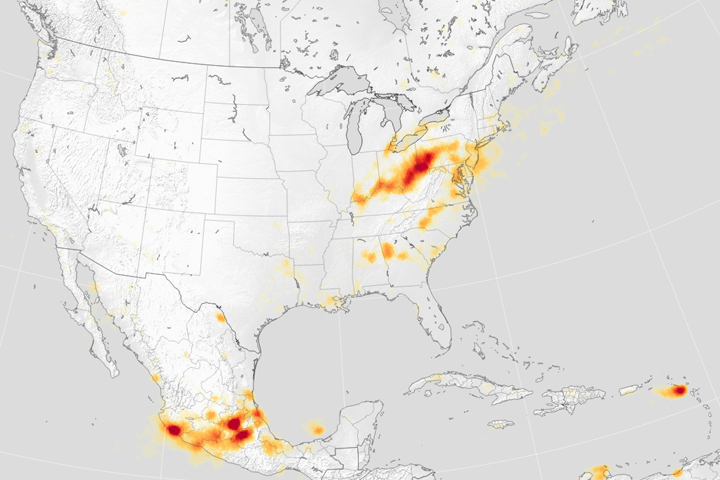 Using a new satellite-based method, scientists from NASA, Environment and Climate Change Canada, and two universities have located 39 unreported and major manmade sources of sulfur dioxide emissions. A known health hazard and contributor to acid rain, sulfur dioxide (SO2) is one of six air pollutants regulated by the U.S. Environmental Protection Agency (EPA). One of the tools that the agency uses to monitor sulfur dioxide is an emissions inventory; that is, researchers collect and analyze ground-based measurements of the gas, while estimating emissions from other activities that produce or emit it (such as motor vehicles and power generation). These inventories help guide regulatory policies for air quality and help anticipate future emissions that may occur with economic and population growth. But in order to develop comprehensive and accurate inventories, industries, government agencies, and scientists first must know the location of pollution sources. 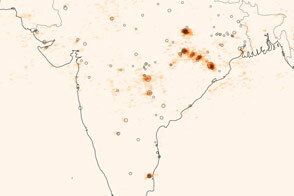 Now satellites have helped them pinpoint some previously missing sources. 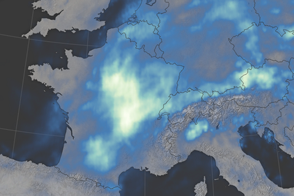 The map above shows a regional picture of sulfur dioxide emissions as detected by the Dutch-Finnish Ozone Monitoring Instrument (OMI) on NASA’s Aura spacecraft. In the analysis of data from 2005 to 2014, McLinden and colleagues found 39 previously unreported emission sources. Among them were clusters of coal-burning power plants, smelters, and oil and gas operations, most notably in the Middle East, but also in Mexico and parts of Russia. In addition, the satellite measurements of emissions from some known sources were two to three times higher than what is being reported in ground-based estimates. Altogether, the unreported and underreported sources account for about 12 percent of all manmade emissions of sulfur dioxide, McLinden noted—a discrepancy that can have a large impact on regional air quality. The research team also located 75 natural sources of sulfur dioxide, many of them non-erupting volcanoes that slowly leak the gas throughout the year. While not necessarily unknown, many of these volcanic sources are in remote locations and not routinely monitored, so this satellite-based data set is the first to provide regular annual information on passive volcanic emissions. “Quantifying the sulfur dioxide bull’s-eyes is a two-step process that would not have been possible without two innovations in working with the satellite data,” said co-author Nickolay Krotkov, an atmospheric scientist at NASA’s Goddard Space Flight Center. 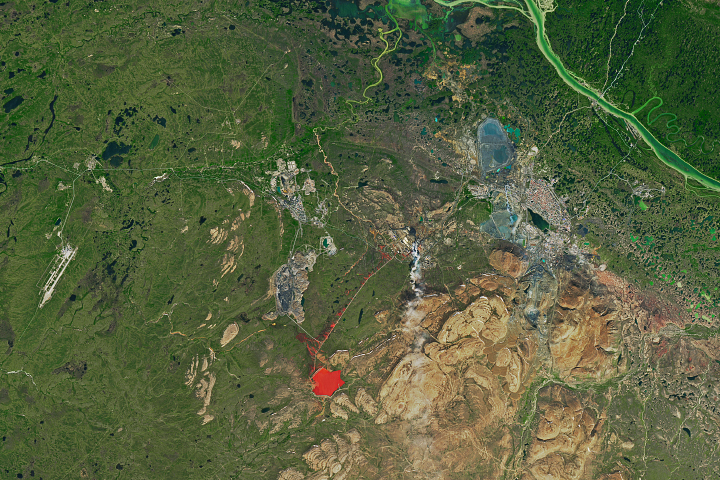 The first innovation was an improvement in the computer processing that transforms raw satellite observations from OMI into precise estimates of sulfur dioxide concentrations. 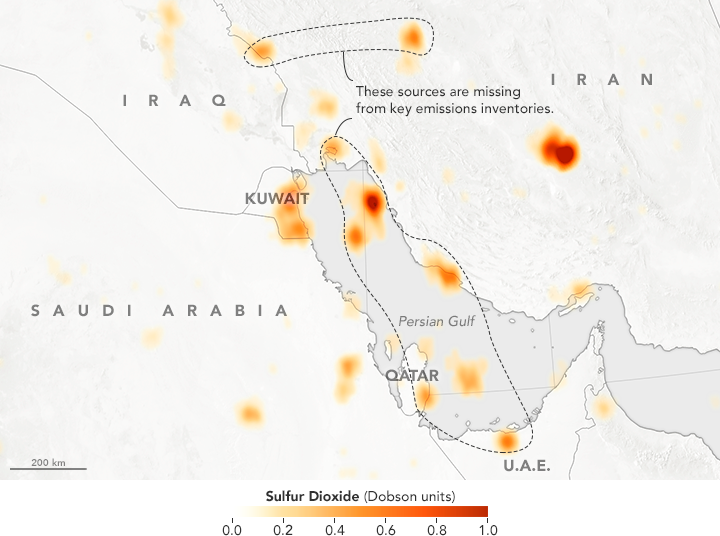 Krotkov and his team can now more accurately detect smaller sulfur dioxide concentrations, including those emitted by oil-related facilities and medium-sized power plants. 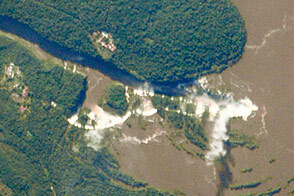 McLinden and his colleagues also used a new computer program to more precisely detect sulfur dioxide after it had been dispersed and diluted by winds. They combined those data with model estimates of wind strength and direction to trace pollutants back to their sources. Researchers from the University of Maryland and Dalhousie University contributed to this study. NASA Earth Observatory map by Joshua Stevens, using using OMI data courtesy of Chris McLinden, et al. (2016). Caption by Ellen Gray, NASA Earth Science News Team, with Mike Carlowicz. Using NASA’s Aura satellite and some new analysis techniques, researchers found previously missing or under-reported sources of the pollutant.